A Creative Genius Made a Movie for 12 year olds – his words not ours. THE George Lucas was introduced by Lucasfilm President Kathleen Kennedy. Three main things about this, 1) we want her job 2) she called him a “creative genius,” which to us is factually accurate and 3) the crowd gave him a well-deserved standing ovation. But shockingly, this wasn’t the biggest ovation of the day…more on that. Mr. Lucas said, “The movie is for 12 year olds.” And that, “Seeing children get excited about the characters and stories is all I ever wanted and the reason why I continue to do it.” Three words came to mind after he said this - ALL THE FEELS. Anthony Daniels (C-3PO), Billy Dee Williams (Lando Calrissian), & Peter Mayhew (Chewbacca) appeared on stage together and reminiscence about working together. Mayhew went on to speak about the late, Carrie Fisher saying, “She’s a hell of a rebel, but she’s also a beautiful princess.” We couldn’t agree more. Billy Dee Williams also spoke about his iconic roll as Lando sharing, “I didn’t want to play a cliché character of color, I wanted to do something more special.” In our opinion, he did just that. The bar is set high for Donald Glover, but Williams said that Glover is a talented guy, but he could never be as cool as him. Mark Hamill joined the group on stage and thanked the fans for treating him better than his own family. Mr. Lucas talked about how important it was to have great chemistry between the three main characters. And THEN, we repeat…AND THEN, Harrison Ford strolled on stage, leading to the BIGGEST applause of the day. This was his first Star Wars Celebration and the crowd showed him nothing but love. There were smiles around the room possibly, enough to fill an entire galaxy. The panel ended with a touching tribute to the Carrie Fisher. 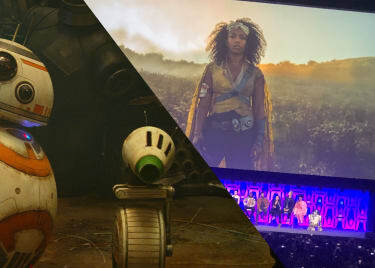 Mr. Lucas and Kathleen Kennedy spoke about the her saying that, “She’s one in a billion and absolutely perfect.” Fisher’s daughter, Billie Lourd also shared words about her mom, “She felt at home talking to each and every one of you and you could talk to you for hours.” They then shared a tribute video of her. If you missed it, see it here. Phew! Day one was emotional and awesome. We heart this galaxy that’s far far away, and everything that is comes with it. 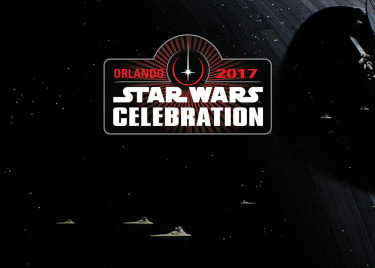 Check back tomorrow for more from Star Wars Celebration. And follow along with us on Facebook, Instagram, Twitter and Snapchat.